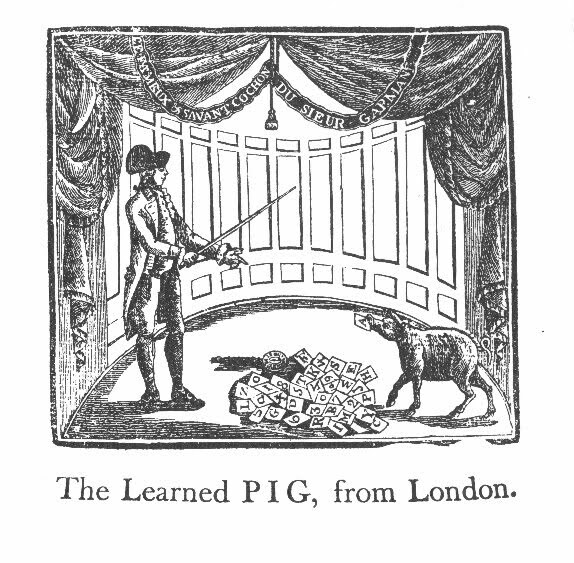 As Russell Potter, author of the new novel Pyg, has been finding in the research he shares on his blog, Federalist printers rarely resisted a chance to use the celebrity and metaphor of a learned pig against their political enemies. The Federalism of the early republic had more than a little snobbery about it. Portland, (District of Maine) Dec. 6. The JACO out-witted, by a PIG! While the Learned Pig was at Saco, lately an admirer of the French requested the pig to tell which was the best nation, France or America? The pig immediately held up a card, with “d--m the French!” thereon. The brave querist would have stabbed the pig on the spot, had he not been stopped by a federalists! The Weekly Oracle printer appears to have worked hastily, producing two or three typographical errors in one short paragraph. Evidently the exhibitor of this pig had prepared with a crowd-pleasing anti-French card. But I heartily doubt that this ever happened as described. Americans who admired Revolutionary France—so-called Jacobins, or strong Jeffersonians—didn’t argue that France was better than America. 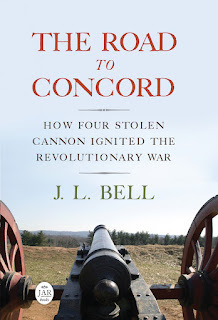 They argued that it was a better model and ally for America than Britain. Surely no one would admit to recognizing members of their own party in that description.